Seventh Street Books, 9781633883598, 237pp. Agatha Christie meets Patrick O'Brian in the first book in a new series of swashbuckling historical mysteries featuring Spider John Rush, a most reluctant pirate. 1722--aboard a pirate ship off the American Colonial Coast. Spider John Rush never wanted to be a pirate, but it had happened and he'd learned to survive in the world of cut and thrust, fight or die. He and his friend Ezra knew that death could come at any moment, from grapeshot or storm winds or the end of a noose. But when Ezra is murdered in cold blood by a shipmate, Spider vows revenge. On a ship where every man is a killer many times over, how can Spider find the man who killed his friend? There is no law here, so if justice is to be done, he must do it. He will have to solve the crime and exact revenge himself. One wrong step will lead to certain death, but Spider is determined to look into the dying eyes of the man who killed his friend, even if it means his own death. 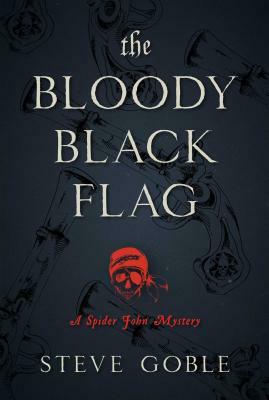 Steve Goble is the author of The Bloody Black Flag and The Devil's Wind in the Spider John mystery series. A former journalist, Goble now works in communications for a cybersecurity firm. Previously, he wrote a weekly craft-beer column called Brewologist, which appeared on USA Today Network–Ohio websites.